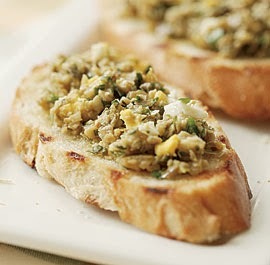 MMMMMMM...... Bruschetta, there are so many variations you can create and top onto a simple crunchy piece of baked baguette. Chop your baguette into about 20-25 pieces, lay out onto a baking sheet brush with olive oil, pop into a preheated oven 350 for 5-7 minutes. Chop your olives and add to a bowl. Thinly slice your basil leaves add to the bowl. Finley chop the garlic and scallions add to the bowl. Add 1/4 cup of grated parmesan cheese to the bowl and toss. Divide mixture evenly among the baguettes, sprinkle with more olive oil and serve.